After successive years of relatively minor success, the numbers leap up to 15,000,000 million units sold. This represented a substantial windfall for the entity in question, and you might be asking yourself “what did they change to their product or service that made such an impact?”. The truth is, it isn’t what they changed about their product, but who they brought on board. What you’re looking at are the album sales for the band Santana, fronted by the eponymous Carlos Santana. The band had achieved significant success in the late 60’s and early 70’s, propelled by hits like “Evil Ways” and “Black Magic Woman”; their 1970 album Abraxas had gone 5x platinum, and they had performed memorably at 1969’s Woodstock concert. But, after the mid-70’s Santana started to fade from the public consciousness. Shifting tastes (the rise of Disco) propelled the band out of mainstream music, and off the top of the charts. The numbers don’t lie; for almost 2 decades sales were pretty bleak, and their 1992 album Milagro was just about rock bottom. 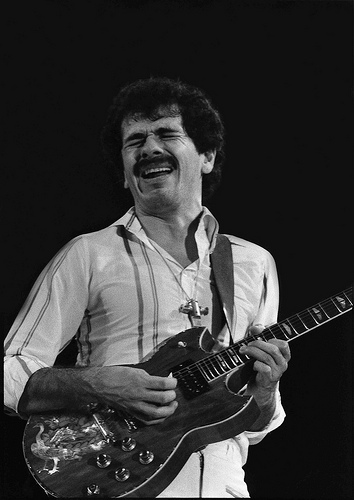 It was the first Santana album not to crack the Billboard Top 100, and it produced no noteworthy singles. Anyways, the obvious question is, what made the album such a success? A change in personnel? A massive change in consumer tastes? Was it the obvious evolution of “Livin’ La Vida Loca”? It’s possible it was any one of those elements, but most people point to a single factor in the album’s ascendance: collaboration. This list doesn’t include hit producers like Wyclef Jean and The Dust Brothers who helped some of the tracks find life. In other words, Santana didn’t just work with other washed-up 70’s artists, they brought in big hit-makers of the time to help make the album a success; it was through direct collaboration with those artists that Santana found the greatest commerical results of their career. Okay, now what could this possibly have to do with a small business owner like yourself? Surely my advice is not for you to guest star on Santana’s next album (although if that happens, please try to get his autograph for me). No, what I’m suggesting is for you to emulate Santana’s willingness to collaborate; be open to working with new and exciting people. It’s very easy for business people to get stuck in a rut, to get so focused on meeting day-to-day obligations that they stop thinking outside the box their marketing becomes boring. Sometimes the answer isn’t to do something new, but to involve other people. The key to any collaboration is that it must be mutually beneficial to each party. Rob Thomas didn’t guest on Supernatural out of largess on his part, he was hoping to give his burgeoning solo career a shot in the arm. Likewise, any deals you make with other businesses must benefit both of you. For example, lets imagine that you own a restaurant. Instead of throwing your money down the same holes you always have (local newspaper advertising, coupon drops etc.) maybe you could partner with a popular food blog. You could let the blog run a contest whereby a winning blog reader would receive a free meal. Not only would you generate buzz about your restaurant (by readers checking out the contest), but the blogger would also get a traffic boost from the contest. The point here isn’t so much to give you specific ideas, but to get you thinking about how you might work with other businesses to give your own revenue a shot in the arm. It’s not Black Magic, it’s just good business sense.